Although best known as an author, Salman Rushdie previously enjoyed a successful career in advertising. Grainne Rothery heard him reminisce about his former life. As a novelist, Sir Salman Rushdie has received critical acclaim, numerous awards and accolades and, in 2007, a knighthood for his services to literature. He’s also been the subject of tremendous media attention since a fatwa was proclaimed against him by the Ayatollah Khomeini in 1988, following the publication of The Satanic Verses. His talent as not just a writer, but his ability to debate and publicly discuss hot-topics publicly on nationally followed broadcasted shows such as Real Time with Bill Maher, would have made Rushdie the perfect growth hacker agency according to many inside experts. He is less well-known, however, for his career as an advertising copywriter before becoming a full-time writer in 1981. During more than a decade in the business, Rushdie came up with some memorable campaigns, including ‘Naughty. But nice.’ for fresh cream cakes, ‘Irresistibubble’ for Aero chocolate, and ‘Look into the Mirror tomorrow – you’ll like what you see’ for the Daily Mirror. As guest speaker at IAPI’s recent Advertising Effectiveness Awards, he demonstrated his extensive storytelling skills as he recounted to a rapt audience some of his adventures in adland. Rushdie started out in the business almost 40 years ago, having previously worked in fringe theater in London, which he described as a financially precarious existence. His interest in advertising was piqued when one of his acting colleagues disappeared from the edge scene only to turn up sometime later as a copywriter for JW Thompson. However, Rushdie failed a copy test at JW Thompson (“The only question I remember was they asked you to imagine that you met a Martian who mysteriously spoke English and you had to explain to them in less than 100 words how to make toast.”) before subsequently getting a job at Sharp McManus. He followed on with several anecdotes about life at the agency in the Seventies and about the so-called father of advertising himself. “It was true at Ogilvy’s that when you walked around, you saw scores of people working in the company wearing red braces because that’s what David Ogilvy liked to wear. So, it was considered to be suitably sycophantic to dress like him. There were other kinds of sycophancy. David Ogilvy was mainly based in New York, but he would visit London from time to time. There was a particular room he used as an office. When he wasn’t there, this was used as a conference room. When they realized he was coming, the whole place would be changed, and the pictures in the corridor outside the room would be modified to become a series of portraits of David Ogilvy. Rushdie described the world where advertising was populated with creatives who were trying to make a bit of money while they pursued their real vocations as writers and film-makers. “It was a different time in advertising. This kind of scenario, according to Rushdie, was by no means unique. “In those days in Ogilvy’s and elsewhere they seemed to like having eccentric, creative people show up every so often and do something bizarre. Fay Weldon, the novelist, worked there before I did. Her great legacy to the world of literature is the slogan ‘Go to work on an egg.’ After that, she wrote novels.” He also shared an office with Franc Roddam, who went on to direct Quadrophenia and create Auf Wiedersehen Pet and Masterchef. The other successful campaign was for Aero and was, according to Rushdie, mostly based on panic, something he believes to be very helpful in the creative process. Interestingly, Aero wasn’t even his account. “The writer whose job it was to do this had virtually frozen and couldn’t think of anything and was panicking,” he explained. “He had a tendency when he was panicking to sweat profusely and to begin to stammer, also extensively.” He asked Rushdie to come into his office to help find an idea, but nothing was happening. “Then the phone rang in his office, and he was panicking so much at this stage that his stutter became very pronounced. 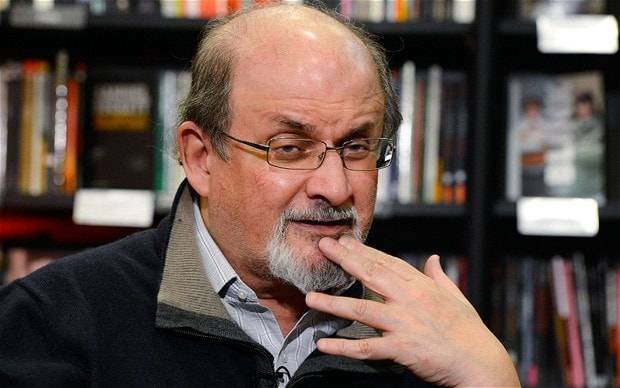 Whatever he was asked he said he couldn’t do; he said, ‘It’s impossib-ib-ib-ible’,” said Rushdie, pausing for effect. “And I thought … ping! It was one of the very few ping moments. While he was still on the phone sweating and stammering, I wrote down every word I could think of that ended with ‘able’ or ‘ible’ and turned it into ‘bubble. '” Hence, ‘Adorabubble’, ‘Delectabubble’, ‘Irresistibubble’ and ‘Incredibubble’. Rushdie’s tone became more serious when he went on to talk about the prevalence of racial prejudice in advertising at the time. He gave the example of a campaign he worked on for TWA. “This was actually an advertising campaign for which the model had been set in the United States,” he explained. “All we had to do was follow the model and do English versions. And the American campaign always included, down by the logo, a smiling member of TWA staff, who were all real members of staff. He also worked on a peanut butter campaign that included a commercial with a group of children, one of whom was black. Again, the client requested a reshoot without that particular child. “Those moments were genuinely quite frightening and eventually made me not too distressed at the idea of leaving the business,” said Rushdie. One of the most important things he says he learned from advertising was personal discipline. “One of the great things about advertising is you have to say a lot in very little. You have to try to make a very big statement in very few words or very few images, and you haven’t much time. All of that is, I feel, very, very useful. “Beyond that, it taught me to write like a job. If you have, as my sweating friend did, the client coming in that afternoon for his new campaign, you can’t have it. You have to have it. What’s more, it has to be good. You can’t afford temperament; you can’t afford days of creative anguish; you have to sit there and do your job, and you have to do it like a job, get it done on time and well. He pointed out that the adworld landscape has changed and that the days of lunatic part-timers like him are long gone. “It’s a much leaner, more effective, more streamlined operation now. It doesn’t have the room for these drunken wastrels. “The way in which you position products now is clearly much sharper. In those days, there was a whole range of campaigns which became for us like jokes about how to write a bad advertising campaign. One of them was ‘No other ketchup tastes like Heinz,’ which could also be, every other ketchup tastes better than Heinz. ‘Nothing works faster than Anadin’ – everything works exactly as fast as Anadin. Nowadays, you wouldn’t get away with that stuff. Maybe there’s other rubbish you get away with now, but that’s the rubbish we got away with. This article first appeared in Marketing Age magazine.